One of Sipe Steel Rule Die, Inc., customers was contracted by a cell phone manufacturer to provide them with a paperboard tray that would be used to securely hold a cell phone inside of its OEM packaging. From their design criteria, we designed the piece from the ground up. The manufacturing process that we ultimately developed included fabrication of precision dies, die cutting, as well as folding and gluing. 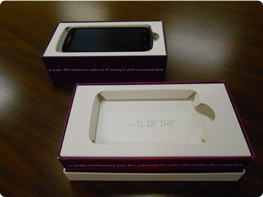 The customer qualified samples with a series of durability tests and the design was approved. Composed of a smooth cardboard stock, the tray featured dimensions of 3.1875" x 3.1875", it was die cut on our Sanwa 1060 die cutter, and finished on our Petratto Metro fold and glue machine. The tray was designed in only 2 weeks, with 48 hour turnover for production. This project represents over 250,000 finished trays. For more information see the table below or contact us directly. Durability test performed by customer.